It is uncertain who made the initial foundation. The first plan may have been projected by King David I who intended to found the house on his manor at Coupar Angus, though it was left to his grandson, King Malcolm IV, to carry out his proposal. The first Cistercians arrived at the site in 1161/2, but it was not until 12 July 1164 that the full convent arrived from Melrose. There was a dedication of the church on 15 May 1233. The house seems to have been a victim of English attack; in 1305 the abbot sent a petition to King Edwards parliament of 28 Feb 1305 seeking compensation for the burning of its granges and other damage. During the mid-fourteenth century, the house experienced some financial difficulties, although there seems to have been a revival of fortunes by the later Middle Ages. In 1521 the abbey had a community of twenty-eight monks; numbers may have dropped slightly during the following decades. By the mid-sixteenth century, Coupar Angus had become the wealthiest of the Cistercian monasteries in Scotland. According to the Books of Assumptions of thirds of benefices, which was begun in 1561, the abbey had an annual income of £5, 590. Part of this income was derived from the wool trade. The community traded with continental Europe, buying locally and exporting via Perth. According to one seventeenth-century writer, the abbey was attacked and burned by a group of Reformers, probably c. 1559. The last abbot, Donald Campbell, died between December 1562 and January 1563 and the property was granted to Leonard Leslie two years later. The abbey was erected into a temporal lordship for James Elphinstone, son of the James Elphinstone who had been granted the estates of Balmerino three years earlier. James Elphinstone, the younger, was given the title of Lord Coupar. It is thought that f ollowing the Reformation the church remained partly in use by the parish while the monastic buildings were used as dwelling houses for the commendator and those monks who chose to remain. However, in or around 1622 the buildings were described as ruinous and it is unclear whether they were still in occupation. After the death of Lord Coupar in 1669 the monastery was used as a source of building materials, and much of the stone was incorporated into the town that grew up around the precinct. A new church was built in 1686, and is thought to occupy the site of the old abbey church. The present church, on the same site, dates from about 1859. The only upstanding fragment of the abbey is the gatehouse but there are many carved and moulded stones around the existing church. 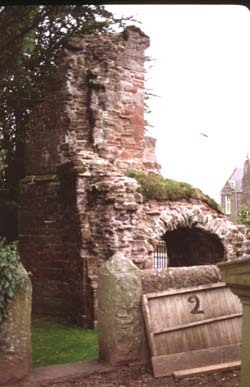 The site is on the south side of the town of Coupar Angus and the remains can be found to the south-east of the church.